CAMDEN – A Willingboro attorney, convicted in July of illegally acting as an intermediary in three adoptions, yesterday was given a suspended jail term and placed on probation for one year. STATE OF NEW JERSEY, PLAINTIFF-APPELLANT, v. EDWARD KENT, DEFENDANT-RESPONDENT. *218 Before Judges SEIDMAN, MICHELS and DEVINE. CAMDEN, N.J., April 14 (UPI) – A lawyer with offices in Marlton, N.J., and Willingboro, N.J., has been indicted for allegedly arranging the illegal adoption of babies. The indictment of the lawyer, Edward Kent, 52 years old, was announced today by Prosecutor Thomas Shusted of Camden County. 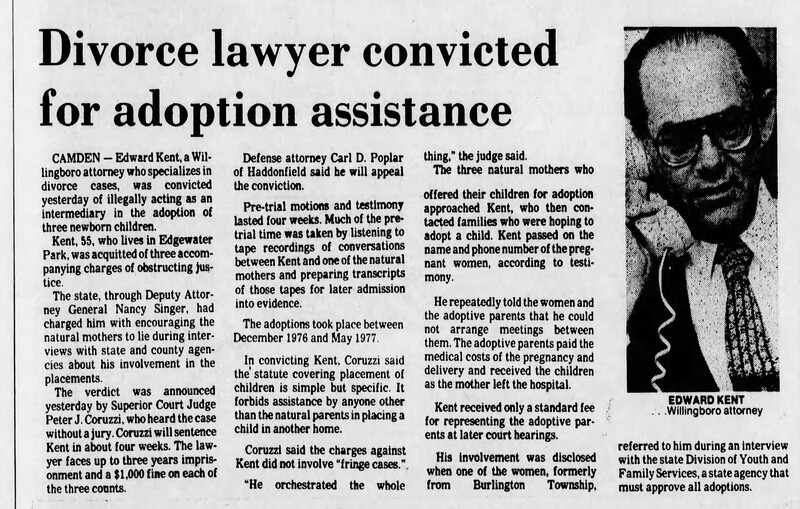 The eight count indictment accuses Mr. Kent of acting as a middleman between the natural mothers and the adoptive parents, which is against state law. Adoptee, Adoption Discovery, Adoption Red Flags, Adoption Reunion, Am I adopted, Amended birth certificate, Could I be adopted, I think I'm adopted, Late Discovery, Late discovery adoptee, Late discovery adoptees, Michelle Riess, Secret sibling, Secretly adopted, True Adoption Story, True Story, Was I adopted? A Burlington County lawyer has been indicted on charges that in 1977 he illegally assisted in the adoption of three children in Camden County, Thomas J. Shusted, Camden County prosecutor, said yesterday. A Burlington County lawyer who specializes in matrimonial matters was indicted Thursday by a Camden County grand jury for illegally acting as an intermediary in the adoption of three children. TRENTON (UPI) – The State Supreme Court Monday reprimanded lawyer Edward Kent of Levittown [Willingboro] for bypassing a Pennsylvania lawyer and dealing directly with his client. The Pennsylvania lawyer, James P. Geoghegan, complained to the Burlington County Ethics Committee that Kent had sought to arrange settlement of an auto accident through direct dealings with Geoghegan’s client.